Upgrade Computer Microphone, NEWHAODI PC Microphone Plug & Play 3.5mm Home Studio Condenser Microphone for Desktop/Laptop/Notebook,Recording for YouTube,Podcasting,Gaming,Online Chatting,Black | Replicafer Co.
♫ Premium Sound Quality:360°Omnidirectional Computer Microphone designed to isolate the main sound source by the sponge cover to protect the sound quality.and filter out background noises for crisp, clear audio and allows you to be heard loud and crystal clear.Good for home studio, Chatting, Skype,Discord, Yahoo Recording, YouTube Recording, Google Voice Search and Steam. ♫ Upgraded Sensor Position to Pick Up Voice Well:The pc microphone sensor is near the sound source to be omnidirectional to pick up your voice without pressing your lips up to the computer microphone ,cupping your hands around it . ♫ Simply Plug&Play:Simply plug 3.5MM metal jack into PC 3.5MM port, select it as your input in your software settings, and you're ready to create your own audio.no need external power.Allows you to use your mic with PC/Notebook/Ipad. 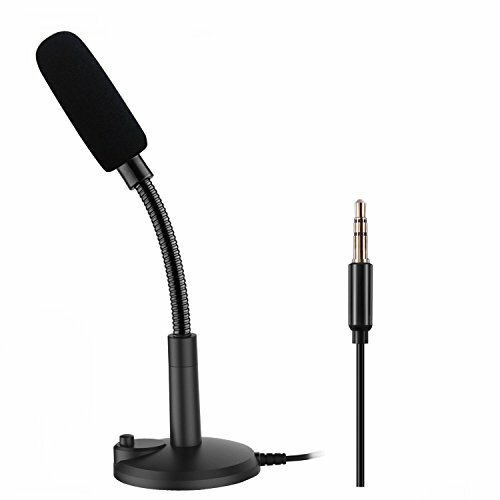 ♫ Flexible & Mute Button Design :360° flexible goosenecks pc microphone allows you to adjust the perfect angle , height or swivel to show your charming voice.The on/ off button setting of the steady wide stand allows you to fix the unexpected noise. ♫100% Money Back Guarantee:1 Year warranty.We have confidence that you will love our computer mic ,if you are not 100% satisfied with our product,please don't hesitate to contact us .You will get your money back . If you have any questions about this product by ZAFFIRO, contact us by completing and submitting the form below. If you are looking for a specif part number, please include it with your message.